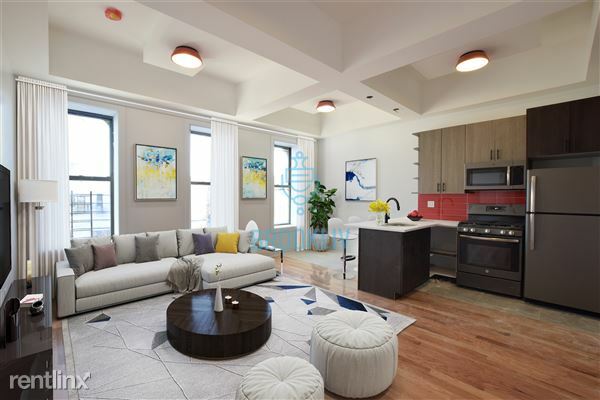 This two bedroom unit is in a building that is not comparable to any other building in Brooklyn! You will love the unique hallways going throughout the building, giving the vibes that you are in a museum of the 21st century. This building was just completely renovated from top to bottom, and will blow your mind. You have a nice laundry room for the entire building as well. Walking into the unit, you will notice the unique red back splash that compliments the marble countertops and stunning kitchen making it hip. The spacious living room compliments the two spacious bedrooms with closet space in the bedrooms and throughout the unit. You will love the hardwood floors throughout the unit as well as the split unit air condition and heat, making sure you can stay comfortable no matter what the weather is outside. Let's not forget the bathroom in this unit that has a spa like shower that lights up blue when you shower and will leave you in awe! This building is located in the hottest part of Bed-Stuy, making it just a few blocks from all the great subway lines such as the G,J and M, making getting to the city or any other Brooklyn hot spots easy and swift! If you don't like to take the subway, with just a short uber or lyft ride, you can get to Brooklyn's top bars, shops, restaurants and sooo much more!! !